As with all juried shows, this year’s annual Utah Ties exhibition is an inconsistent mixed bag —some works evoke the grotesque and the abject, while others are quietly beautiful and even majestic. As a collective, the show includes a select number of truly remarkable pieces here and there and a spattering of undergraduate-level work. 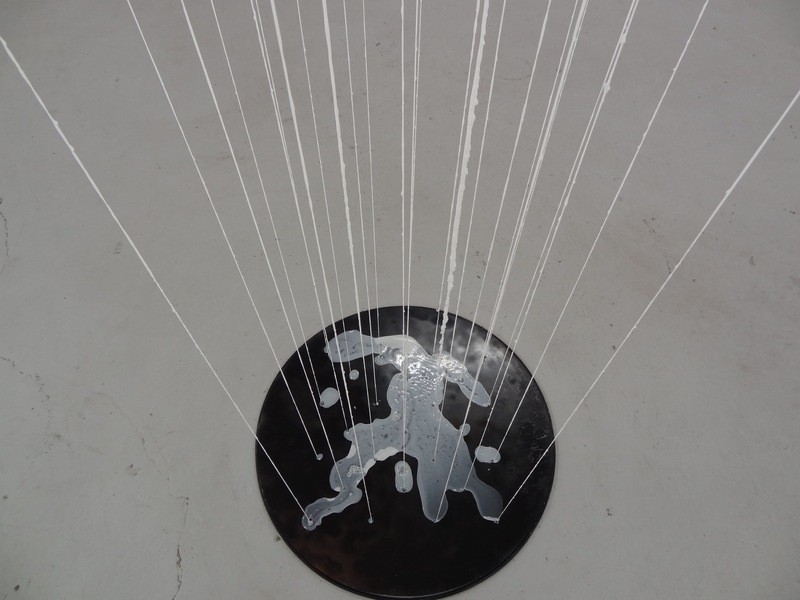 Take for instance Maia Bromley-Dulfano’s work “B.A.D. (Bad Air Day)” (2015). 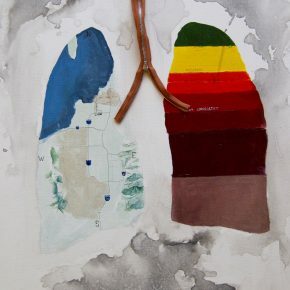 Her small acrylic painting and collage explores air quality in a naïve way, literally mapping the lung on one hand, and then coloring in the graded warning levels of red days and yellow days in a way that reads like earnest literalist aesthetic propaganda. 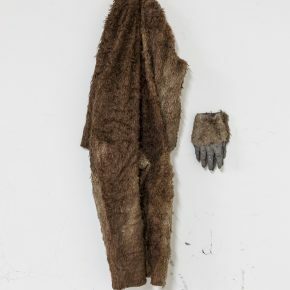 Or take Jason Metcalf’s yeti suit from his performance in “The Curse of Master Mahan” (2012), which hangs on the wall like the returns section from a costume shop. To be clear, the concept of this piece is strong and the performance interesting but when displayed without easily-accessible context and unaccompanied by documentation of the performance upon which it is based, the work falls flat aesthetically, and makes the object look discarded, misplaced. 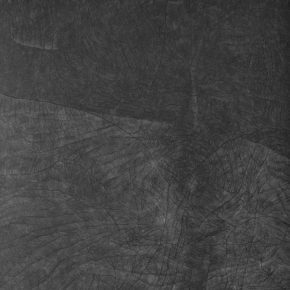 But then there’s Al Denyer’s “Green River IV” (2015),a drawing so dark that it causes the viewer to continually look, deeper and deeper at the surface, that seems to bend and fold, simultaneously, making the river known and unknowable. 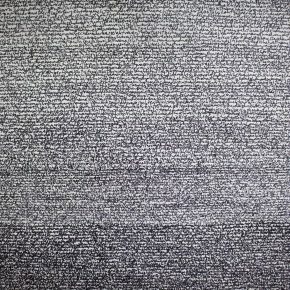 Or take Ryan Neely’s monolithic “NOMROMFOKOOBEHT” (2015), a handwritten version of the Mormon scripture, The Book of Mormon. Antithetical to Ben Howell’s handwritten devotional “Transcription”(now on display at UMOCA in the exhibition Church and State), Neely’s work seems to unwrite the text, unmap the context of words, retranslating scripture into nonsense. Indeed, it is a culturally-loaded piece, like Bromley-Dulfano’s, but one that doesn’t have the message usurp aesthetics. To be clear, I mean these binary comparisons and the claim of inconsistencies only partially as a slight. Juried shows, by nature, come with their own subjective bias implicit in the process. They manifest a single taste preference, which often leaves itself open to criticism in the singularity of it. This is especially true when it manifests a perceived outsider’s perspective. “Juried shows as art shows are weird,” says CUAC director Adam Bateman. I agree, and that weirdness is particularly the net result of an open-call submissions and what sometimes seems as arbitrary selections. Bateman continues on the notion of weird by saying, “The blind jury process is funny because on one hand, it’s totally arbitrary and on the other hand, there are a lot of consistencies.” Consistent yes, old Salt Lake favorites are included, such as Metcalf, Stephanie Leitch, Cara Despain and Marcela Torres, to name a few — the latter two having taken home the prize money for “Best in Show.” Unpacking Bateman’s claim then, consistent inclusion seems to attest to these artists’ significance, which has transcended a local bias. However, juried shows are by nature arbitrary, not only because they represent a single subjectivity, a ruling based on a small fraction of online thumbnails, but also because the process can be limiting because some works shine online, yet fall flat in person, and vice versa. Implicit arbitrariness is an important revelatory element, however. All exhibitions are, to some extent, arbitrary. We all have our favorites, our biases, our personal experiences, our psychoses that feed into the selection process. If the end product of an exhibition lacks a cohesive sense of curatorial voice or thematic arch for the audience, what then is one to take home? Now in its ninth year, one of the professed purposes of CUAC’s annual show is first to showcase a breadth of established, new, and emerging Utah artists. Utah artists being defined as artists living in Utah, as well as artists living outside of Utah but who either are from Utah or who have spent time academically or professionally in the state. Included this year are 23 artists (out of the 190 who applied, about 12%) — the already mentioned Metcalf, Neely, Denyer, Despain, Leitch, Torres and Bromly-Dulfano, as well as Alexis Furlong, Elizabeth Morisette, Edward McKenna, Ashley Wilson Wall, Chris Gariety, Mike Richards, Chandler Dee, Jamie Harper, Sherri Wright, Samuel Carpenter, Mitchell Barton, Kevin Marcoux, Rachel Barney, Rachel Stallings, Justin Watson, and Levi Jackson (though Jackson self-selected out of the exhibition due to logistical issues). The second purpose of the exhibition is to introduce Utah artists to an outside curator. McCarthy herself has Utah ties, coming from parents who grew up in Utah and attended University of Utah, Weber State and were descendants of Mormon pioneers. Such biographical information is important to point out as it suggests that McCarthy is an informed outsider, who can, at least in part, speak the language or at the very least, recognize symbols of the local culture. 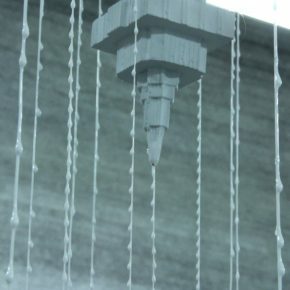 Recognize she did, as some of the work of the back gallery includes pieces that make specific reference to uniquely Utah visual culture such as Stephanie Leitch’s “Untitled Ordinance” (2015), a sculpture of Jordan River Temple figurines, suspended in the air upside down on a grid, and dripping with glue. Only 12% of all applicants were accepted into this year’s Utah Ties show. So, in the end, a juried show like this doesn’t tell us much about the comprehensive picture of Utah artistic production nor does it produce a cohesive well-unified exhibition. Where Utah Ties does succeed, however is in adding an additional set of critical eyes on our artistic landscape, offering the juror’s biases, opinions, and subjectivity. Given the small pool of tastemakers that practice in Utah, such introduction is valuable in and of itself even if the net product is mixed. This review appeared in the April 2015 edition of 15 Bytes. So far as I know, this year’s Utah Ties juror, Mara McCarthy, did not make a statement of her reasons for choosing as she did. Indeed, Laura Hurtado, who knows art and whose comments are sharp and incisive so far as she goes, identifies the lack of a clear theme as the show’s principle flaw. That said, a pattern is discernible: one typical of how Southern Californians (and no doubt others) see Utah, with its undeniable religious influence, popular frontier isolationism, and alleged intolerance to progress. McCarthy, who founded ‘The Box,’ one of LA’s innumerable galleries, may be excused for hesitating to spell out her view of Utah, but coincidentally or not, each participating artist’s relation to the ‘box’ that is Utah’s traditional religious and historical culture, something an outsider might see more clearly than a native, is a symbolic key that can be applied to the chosen works. Some of the artists are content to dwell within the box and comply with its norms. Others try to get out. Some (as recent headlines attest) want to remodel the box while remaining inside, and still others are content so long as they can move around freely, secure in their freedom from eternity and confident they can exit when they choose. It may even be that the contrary influences of this box on the lives of our artists is what gives the local scene its oft-noted creative energy. In “B.A.D. (Bad Air Day),” Maia Bromley-Dulfano used a zipper to date her mixed-media study of air pollution to modern times. The zipper superficially represents a bifurcating windpipe that connects two lungs to roiling, black clouds. In a deeper sense, though, the statement a zipper makes is as much philosophical as technological, dividing and re-uniting the two sides of a coat, a trouser-fly, or an abstract, official air quality report and the subject lungs of the viewer, lest we forget that the numbing repetition of those numbers actually measure the dimming of out days and the shortening of our lives. Two people can disagree about an artwork and both be right, as Laura Hurtado and I did on this one. I happen to enjoy the rough-and-ready surface and polyglot associations so often found in multi-media works, especially those incorporating found objects, like the zipper, in order to multiply meanings and associations. She might reply that aesthetic unity suffers, and she’d be right. But as I looked at Utah Ties 2015 for myself, comparing her responses to my own, I began to see a more pressing need. We should have a new ground rule for art that, whether called ‘post-modern’ or ‘contemporary,’ breaks with a fundamental principal that evolved during the Renaissance and was honored until now. Since the end of the Middle Ages, artworks have stood on their own, autonomously. Their appreciation might require an educated acquaintance with everything from ancient mythology to recent history, but they didn’t (and shouldn’t) require the audience to read minds, nor should the present-day curator become like those medieval priests who led the illiterate through the cathedral, dictating the meanings of stained glass windows, painted walls, and statuary. Some examples follow. In Some Apart, Sherri Wright has push-pinned a snapshot to the wall: no presumptuous frame, no self-important visual gestures. A cloudy white smear on its surface prevents it’s fully showing several people who stand in a line along a horizon: in the foreground, a slope of sand atop which they pose; behind them, a blurred landscape. Four fragmentary figures can still be made out, but evidence suggests a larger group, amidst blankets, perhaps at a picnic or on a beach. Unless a viewer reads the artist’s statement, which begins ‘What I Lost When I Left,’ the full import will almost certainly escape. The sole clue comes from the old-fashioned wall label, which identifies the adulterating substance as ‘joint compound,’ an ironic name for a material that divides those in the picture from us who contemplate them—including the artist. From the statement, we learn that this is Wright’s family, substantially alienated from her by her choice to leave their religion. Given the remarkable poignance of how she tells her story in words, she might have done well to put the entire statement on the wall. There is nothing in today’s practice to discourage her including such a block of text to balance the photo in the final work. A few short steps away, a dry brick chimney constitutes the artifact remaining from Jamie Harper’s Performance, “A Structure For You.” Like videos, which happen in time as well as space, and so rarely work well in a gallery, the continuing presence of a Performance during the exhibition makes demands on curators and audiences alike, who both need to make sense of something now incompletely present. Hurtado made this point regarding Jason Metcalf’s “The Curse of Master Mahan,” which is also present in Utah Ties ’15 as an artifact, although it’s date—2012—would seem to disqualify it from an annual dated 2015. Both these works defy easy conjecture, even as the artists’ statements suggest edgy, ambitious actions to witness and contemplate. In virtually every instance, either the work itself or the accompanying statement shows the artist negotiating a stance within the context of pervasive public opinion: a relation to the box. Even seemingly stand-alone subject matter, like Al Denyer’s ongoing Green River series, an ecological project that also pushes back the frontiers of drawing, joins “B.A.D.” in querying the limits of individual opinion and free expression in a predominantly conformist society. When everyone hangs back, looking to others to see how to behave, a drawing like Chandler Dee’s This Must Be the Place seems an almost heroic, individual vision. 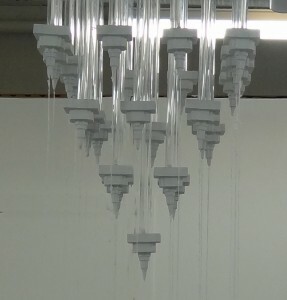 Two large works show some small idea of the range of possibilities. In NOMROMFOKOOBEHT, Ryan Neely’s 80-square foot, backwards transcription of the the entire Book of Mormon, the artist struggles valiantly with the founding vision of the box, as though only by coming as close as possible can he hope to escape its gravitational power. 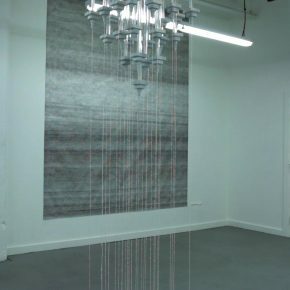 In “Untitled Ordinance,” Stephanie Leitch uses her remarkable formal powers in a wonderfully ambiguous, centrifugal exploration, in which her signature string-lines-in-space, aided by glue and gravity, represent the ultimately entropic forces at work in organizing the world, while the order they create breaks down even as they advance. Macrocosm and microcosm are present and made visible, and the box becomes a theatrical stage on which a cerebral drama enacts itself. Laura Allred Hurtado is the Global Art Acquisitions Specialist for the LDS Church. She has worked at SFMOMA, BYUMOA and UMOCA. She received her master’s degree in Art History from the University of Utah. Planet earth to comment counter . . . planet earth to comment counter . . . come in, comment counter . . .